Your wedding day is a unique day in your life. It should be as perfect as possible. You can't control the weather but you can control almost everything else. There are many experts available to help you put together, 'The Perfect Day '. We are one of those experts and we would love to assist you with your wedding entertainment. If everything has gone to plan, you both will have been looking spectacular and the ceremony will have been a true celebration of your love for each other. Speeches will have been witty and concise and the reception meal will have been a gastronomic delight. Everyone will have enjoyed your company and be looking forward to an evening’s entertainment. However, with well fed guests and five to seven hours of music ahead, there is a problem. No one is ready to dance! And they won’t be ready for a while. We call it, 'The Dead Zone'. It is the time when the fizz can go out of what has been a successful day. This is where we at Mulsanne Casinos Belfast fit in. 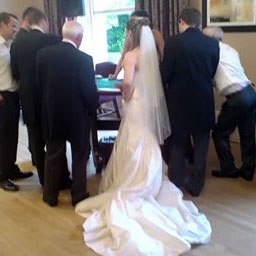 We will provide the excitement of the Roulette Wheel, Blackjack cards and dice for your guests. Our tables and croupiers will be ready to entertain, straight after the meal. We can fit in to your surroundings - setting up a Casino at Galgorm Manor to Roulette at The Culloden in Belfast. There is no real money used. Instead, 'funny money' is given to the guests. Everyone, from five to seventy five and older, can play. The family members and guests who don’t know each other will be mixing and playing together in no time! We can play for anything between one and three hours and by then the time is right for your first dance. Unobtrusively, we will quietly slip away and your wonderful day continues, having had no dip in energy level and no sign of any 'dead zone'. We have also provided other entertainment at wedding receptions, namely master hypnotist, Don De Gouvea and our horse race events. Both successfully serve the same purpose as the casino, namely, filling the ‘Dead Zone’ with entertaining activity for your guests. View our full profile in the FreeIndex Mobile Casinos Directory directory.